Welcome to Sri Lanka, where the political crisis is getting worse by the week. 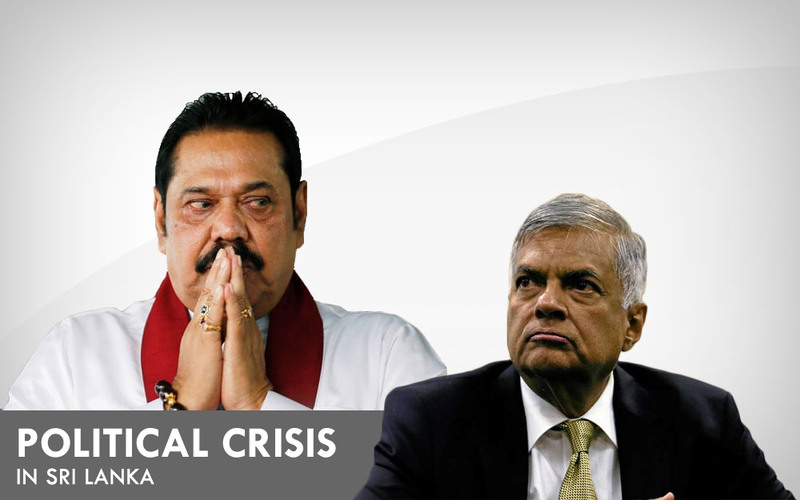 The trouble started when President Maithripala Sirisena, fed up with disagreements with his prime minister over money, an alleged conspiracy plot and unresolved issues of wartime crimes against civilians, fired Ranil Wickremesinghe and his Cabinet and replaced them with a government headed by a popular former strongman, Mahinda Rajapaksa. But lawmakers balked and twice passed a no-confidence motion. Sirisena, however, refuses to accept that his choice of prime minister has been defeated. Jehan Perera, head of the local analyst group National Peace Council, said that the government appointed by the president can’t be called legal because Sirisena had not sought a parliamentary vote when he dismissed Wickremesinghe. “It can be called illegitimate because provisions for a confidence vote in Parliament are being blocked by the president’s own party through their riotous behavior,” Perera said, referring to a brawl last week that was followed by another pandemonium in the chamber when Rajapaksa loyalists refused to let the speaker conduct proceedings. Wickremesinghe says his dismissal is invalid because he still holds a majority in the 225-member Parliament. The dismissal is also disputed because of a latest constitutional change, which lawyers say has taken away presidential powers to dismiss the prime minister. Despite all the drama and two rival prime ministers, life hasn’t collapsed – thanks to the efficient bureaucracy that keeps the wheels of administration turning. Even though there is no Cabinet recognized by Parliament, and despite warnings by Wickremesinghe supporters that state officials should not take orders from an “illegal government” of Rajapaksa, bureaucrats continue to work with the president who is the chief executive and the ministers appointed by him, officials said on condition of anonymity because they are not authorized to speak to the media. However, decisions regarding new projects or purchases involving large sums of money are on hold. The absence of a recognized government has delayed the budget for 2019. Mangala Samaraweera, who was finance minister in Wickremesinghe’s Cabinet, said that there will be no legal way of spending money in the coming year without a parliament-approved budget. Sri Lanka’s Constitution says that control over public finances lies with Parliament and no funds can be released without a warrant signed by the finance minister and approved by the legislature. That means all government payments starting from January can be deemed illegal, Samaraweera says. “The cavalier and irresponsible actions of the president … based on personal animosities and precipitating a series of illegal acts, places at risk Sri Lanka’s ability to meet its immediate debt obligations,” he said. Sri Lanka has to repay $1 billion of its foreign loans in early January, which is also in the prerogative of Parliament to approve. Wickremesinghe’s lawmakers have presented a motion to the speaker seeking to block funding to the prime minister’s office, which if passed, would curtail Rajapaksa’s functions. “As far as the people are concerned, they are witnessing the normal functioning of the country,” insisted government spokesman Keheliya Rambukwella. However, he conceded that Sri Lanka will have issues on accessing government money if the stalemate is not resolved by the end of the year. Snap elections are set for Jan. 5. Do all of us know what a billion rupees is . Then what about billion dollars .how many voters know the value .when someone goes to a bank to take a loan , replayment criteria shouldbe shown to the bank . Mr .Samaraweera , at least you must ask public whether they know ,how many zeros to one billion dollars in rupees .our less intelligent ,vastly literate public have no idea about what you people speak.at least Mr Knows how to speak to common man.also Mr Premadasa knows . Public should know what you all are talking. Did Mr Rakapakses finance minister ,great Bandula Gunawardena ,the economist ,knew about it ?he was the commerce and economics tutor for lakhs of students .He should talk the truth like before without insulting his students whom vote for him under MEP banner. What will the rest of the world think of us? unp nor the slfp of various shades have no right to govern for they have not got a simple majority in parliament. The unp having mustered the highest number of seats in the parliament was requested to form a government with a coalition of other political parties, The yapalanaya coalition was the result with SLFP a major stake holder of the coalition. The biggest farce was the fleecing of the Central bank by ranil appointed governor backed by the finance minister and most likely backed by some top bureaucrats of the bank. Regardless of commissions the government failed to conclude the magnitude of the scam nor those insiders involved in the scam. And while the scam was put to rest other ministers dedicated to rob their ministries and undermine the workings of the government. Plantation industry alongwith agriculture collapsed leading to an economic crisis a crsisi that will not be resolved in the forseeable future. The only option is to dissolve government and call for fresh elections and let the people decide to vote crooks out of office for good. The elections should be conducted in good faith and the police should make sure that voters be intimidated by thugs employed by the candidates. The members of parliament members ought to be taught the fundamental procedures and code of conduct. The conduct of parliamentary members over the years have degenerated to a level such that it would be impossible to rehabilitate until some such time the electorate rejects them. This too has gone beyond reemption for the electorate is not free to exercise thier rights because of the intimidation by gangs that back the candidates through threats. When the judiciary is corrupt one can expect little from the police whose job is to protect civil liberties. Under these circumstances it is only natural for the army to step in to restore order at gunpoint that might escalate to a bloody insurrection between those that support various factions. This is inevitable considering the role that the judiciary that has played iin recent times. In the very near future the magistrates will be easy tragets for assasins and these jobs in time to come will go begging. this for the simple reason that the magistrates cannot be considered honotable in spit of the powdered wigs. You can educate only those who are willing to learn. > 90% of our parliamentarians and Man in the King’s Chair are illiterate (by Sri Lankan standards) and are TOTALLY incapable of thinking or learning. The Armed Forces are totally incapable of leading their own troops where atrocious behaviour under command has lead to war crime allegations (with evidence); how can we expect them to lead a Nation? Who is at fault? The Voters, who keep returning these buffoons at every election, parliamentary, provincial and local governments. We, the voters in SL, deserve this, my dear Zama. It is not a matter of ‘What will the rest of the world think of us?’. The World has LABELLED our beloved Island a PARIAH NATION (similar to Zimbabwe and other African Countries and Myanmar where Dictators rule). By next week, we will see INTERNATIONAL SANCTIONS.